Some have asked me the story about Rupert and how-like another student of micro footie Jacob Lensky-made it to Celtic. I think it’s a good one so here goes. Always impressed by this kind of player: (getting hammered yet the attitude of still giving full effort). As a result, without really knowing Rupert too well I emailed his family offered him an award. Outstanding sportsmanship in the micro footie season. The prize being a complimentary opportunity to play in our micro footie development curriculum every Sunday. Rupert loves soccer and of course he accepted. This gave me a great chance to see him week after week. He was a diamond in the rough. I told his family as much. Anyway Rupert signed up for our Curriculum, took part in our camps and was a regular attendee at the Celtic camps. As a result he was improving more and more. We even created an exercise called The Postma (his last name) because he was so good at it compared to the others. But, in February of 2015 my credibility took a hit. Rupert had a try out to make what is called Gold 1 in Vancouver. He was currently in Gold 2. Two clubs had a team of evaluators out and after the assessments both clubs didn’t see Rupert as a Gold 1 player. Anyway, despite this lack of acknowledgement by the evaluators, I insisted to his family Rupert was a player with potential. Around that time Celtic FC who -micro footie is affiliates – were holding a showcase weekend at the IMG Academy in Florida. We were meant to take our top players who were available. I invited 9 players. Rupert was one: the youngest of the micro footie group. He had never been on a plane, was shy and obviously my wife and I felt protective of him. Although looking back he settled no problem. The IMG event included talks by the Celtic coaches and great on field sessions. There was easily a couple of hundred players: the best of the North American affiliates so the competition was high. 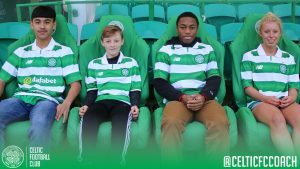 The purpose of the IMG experience was to train the players the Celtic way, give them an experience with the ultimate prize an all expense paid trip to Scotland to play with the Celtic Academy and attend St.Ninians school. (where all the Celtic academy players go).Celtic FC would pick 4 players: three boys and one girl. Yes, you guessed it. Rupert was selected. The youngest of the four. For the last seven months we have been preparing for this very special week. Prep has included going to the Celtic camps over the summer, taking part in the weekly micro footie development skills curriculum, mentorship one on one sessions and consistent train like an athletic workouts @ TLA. Strengths: Rupert has a wonderful shy but cheeky personality, a great left foot and passes with real intention and great focus. He doesn’t act a big shot-and quite the opposite-is humble as pie and gives tons of effort so therefore is easy to coach. He is also willing to improvise in tight situations with creative play and always looks as if he is enjoying himself radically. At training sessions. I have seen him laughing away as he is pulled on a sled by National player Ben Fisk, nutmegging me as I am coaching (surprisingly easy) and takes advice like a champ. And it all started because he got noticed by giving tons of effort week after week in a team that were admittedly quite poor. He will be back from his Celtic experience soon. Rupert with the CelticFC U13s. Tomorrow @ TLA yoga with Emily of Subscura. Sessions @ 6,7 & 9 am. TLA offers monthly athletic testing to our adult clientele. The testing including finding out body fat levels combined with testing strength, power and speed. As soon as testing is mentioned the emails come in fast and furious as to why clients won’t be in. Fear is one. However the biggest reason is athletic testing isn’t perceived as a true workout. This is a shame. Why? 1. With athletic testing the impression is since the quantity would be small and the rest periods high the workout would be easy. Yet this couldn’t be further from the truth. Testing is always about maximum effort and there is nothing harder than maximum effort. 2.The youth and elite levels at TLA love athletic testing. In fact they have embraced so thoroughly they are always asking for the next one. We can learn from their go to efforts to always want to develop and improve. 3. Testing allows us to find these necessary athletic traits that need to be developed otherwise as coaches we are just guessing. 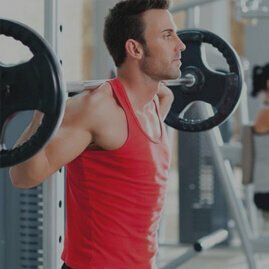 Whenever an athlete is learning a new skill, practicing technique on a skill or displaying maximum speed or power they are predominantly using their nervous system and that training must be done when an athlete is fresh. We need to understand the role fatigue plays in a training session, and understand that training the nervous system and the cardiovascular or metabolic system are two very different animals. Both animals need equal care. By skipping and instead just doing the hard work clients will not fully develop these important nervous system traits, and never reach their potential for strength/speed/power. Yes, you will be in great cardiovascular shape, but you won’t be as fast, powerful or technically proficient as you could be if you took the time to develop technical traits first. A pre match tester w/@benjaminfisk Set up a 8-10 m area beside wall. Strike wall three times in three different areas and then sprint w/ball to restart. Do 6x in under 40 secs-rest 1.20-repeat other way=1 set. Do 3 sets.